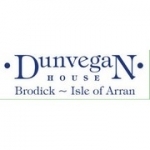 Dunvegan House is situated within the picturesque village of Brodick on Arran only a short walk from the ferry. It is a traditional sandstone building that has been tastefully renovated and decorated throughout to create a spacious four star licensed guest house that offers superb accommodation for the holidaymaker. Owned and managed by Helen and George McAdam, it sits right on the sea front, between the pier (Arran's main ferry terminal) and the heart of the village. From here you get magnificent views of Brodick Bay, the Ayrshire coast and Goatfell, Arran's highest mountain. The guest house has nine rooms, eight of which are fully en suite and the ninth having private facilities and all are beautifully furnished and decorated, with a TV, radio/alarm and tea and coffee making facilities. There is a cosy and welcoming guests' lounge, where you can relax after a hard day's sightseeing or hill walking. It even has a small cocktail bar where you can choose an aperitif and savour it slowly while studying the evening's menu. The dining room is bright and airy, and overlooks Brodick Bay. Helen and George pride themselves on the high standards of their cuisine, and use only the freshest of local produce wherever possible. Whether it's the full Scottish breakfasts or the beautifully cooked and presented evening meals, you are sure to be amazed at the wonderful service and great value for money. The table d'hote menu includes such starters as melon and prawn salad, cream of carrot and ginger soup and crepes filled with mushroom sauce and topped with cheese. The main dishes include Kintyre grilled salmon, Scotch sirloin steak or chicken with Arran mustard. You can then choose from a selection of sweets or the cheeseboard. Other menus are available on request. This is the ideal place for a relaxing holiday on one of Scotland's most beautiful islands, and if you arrive by ferry, either Helen or George will be more than pleased to pick you up from the ferry if you give prior notice.